Colorectal, or bowel, cancer is the second biggest cancer killer in Europe. It is most commonly treated with a combination of chemotherapy agents, and outcome can be improved by using additional drugs. However, this multi-drug approach can increase side-effects such as hair loss, low white blood cell count, diarrhoea and damage to the peripheral nervous system. The team from Manchester counted tumour cells in a patient’s blood sample as a way of predicting who might benefit most. The group looked at patients with advanced colorectal cancer who received a four-drug combination treatment. They confirmed that those patients with three or more circulating tumour cells (CTCs) in their blood sample had a lower overall survival, compared with those patients who had fewer than three CTCs. The team also presented data that suggested that patients with a higher CTC count before treatment could benefit more from this more intensive treatment regimen. 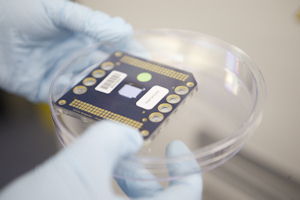 Cancer is one of The University of Manchester’s research beacons – examples of pioneering discoveries, interdisciplinary collaboration and cross-sector partnerships that are tackling some of the biggest questions facing the planet.